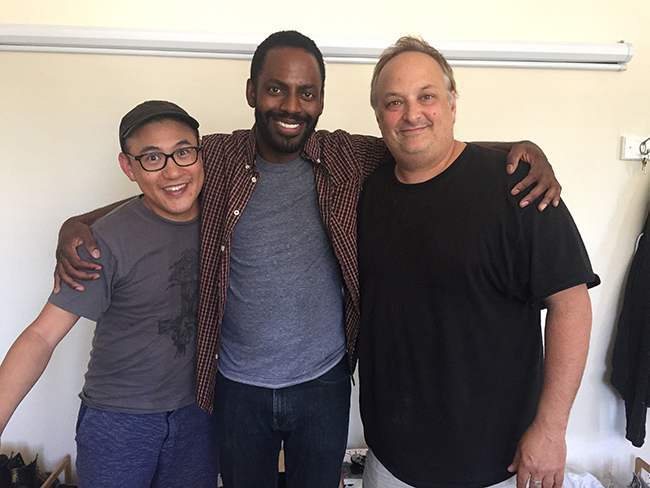 On Ep 66 Paco and George met up with the talented and hilarious Baron Vaughn to discuss the very personal documentary Baron made called Fatherless. In America, one in four children grow-up in homes led by single mothers. This was the case for actor/comedian/writer Baron Vaughn (‘Grace and Frankie’) who, with the support of his mother, chose not to let a statistic define him and set out on a quest to search for the father he never knew. Baron’s journey and the revelations about his upbringing are chronicled with a flair for both the comedic and heartfelt in the new doc. Baron Vaughn is a series regular on Netflix’s Grace & Frankie in the role of “Bud” with 3 seasons currently streaming. He is the voice of “Tom Servo” in the new Mystery Science Theater 3000: The Return also streaming on Netflix.